Grow fruits, veggies and picture-perfect plants without a traditional garden. Ketchum resident Diana Anida has mastered the art of container gardening. For the past 10 years, she's lived in a basement apartment in downtown Ketchum, where she grows a wide variety of edible plants on a small concrete patio. Her key to success? Big pots. "Big pots can be found for cheap, at places like the Gold Mine," Anida said. She starts her plants in April, covering them when necessary to prevent freezing. Success with lettuce, snap peas, chives, potatoes, rhubarb, sweet carrots, garlic, onions and a variety of herbs have made the lack of a large garden in which to ply her green thumb a mere annoyance rather than a major sacrifice. Minimal space is no excuse for not growing your own food, or for not having a beautiful, colorful patio. Even the smallest of spaces can produce a surprising amount of food and flowering plants, and growing them in a variety of containers will add to both the aesthetic and stock cupboard of any condo-dwelling valley resident. Getting started is as simple as selecting the proper containers, choosing the correct planting media and deciding on the ideal planting combinations for your available space and desired results. 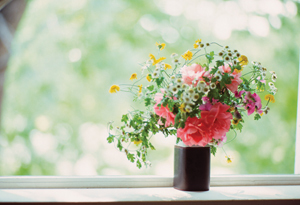 Container gardening provides a great opportunity to repurpose old household items. Pretty much anything that will accommodate drainage holes can become a feature in your new garden (see sidebar). If you choose to shop for more traditional containers, bear in mind that wood, clay and unglazed ceramic containers lose moisture more quickly and will need more frequent watering than will plastic, metal, fiberglass or glazed pots. Metal pots invite temperature fluctuation, as much as 30 degrees between day and night; however, roots can be protected from extremes by lining the pot with bubble wrap or 1-inch-thick foam. The next step is selecting the medium in which the plants will grow. Garden soil should not be used as it may contain pests and some soils don't drain well. A soil-less mix of mulches or compost works well, or create a soil mix from one part compost, one part perlite, vermiculite, or coarse builder's sand and one part pasteurized soil or potting soil. When space is at a premium, grouping a variety of plants in each container is key, but it's important to choose ones that cooperate with one another. Select plants with closely related needs; for example, most warm season vegetables and fruits do best in full sun, at least six to eight hours a day. Some fruits and a few vegetables tolerate partial shade during the hottest part of the day. Herbs and cool-season vegetables need only three to five hours of direct sun a day (preferably morning sun). Grouping can also be based on harvesting time (spring, summer or fall crops); form (round, horizontal, oval, upright or trailing); size (small plants in front and underneath and large plants above and behind); texture (coarse, medium or fine) and color of flowers, leaves or fruit. Allison Marks, program director at the Environmental Resource Center, recommends working outward according to size, so plant beans in the center with lettuce and nasturtiums below or vining cherry tomatoes surrounded by basil. "You can grow many things in small spaces, even corn!" Marks said. "I've started to plant my flower container with only edibles. There are so many colorful varieties, why waste space with nonedibles?" "In small spaces the best idea is to go vertical," she said. A tiered hanging garden is one way to "grow up." Old spouting/gutters, wooden planter boxes, wooden crates and clothes drawers can be cobbled together to create a beautiful cascading garden. The main thing to consider here is weight—make sure it is well secured and that the plants don't become too cumbersome for the container. Whatever the size of your outdoor space, from a windowsill to a large deck, creating a container garden can provide a sampling of almost everything you might expect from its traditional counterpart. • A metal tool tote or tool box makes a perfect home for a succulent garden. • A pot, teakettle, colander or pitcher is a whimsical alternative to the traditional home of a pot plant. The colander has the advantage of already having drainage holes. • A wheelbarrow is an inventive and easily relocatable container for a small vegetable patch. • Reuse old guttering and create a spouting garden. Using strong wires or chains, hang the guttering horizontally, one on top of the other on the sunny side of a structure. Fill with soil and plant lettuce, herbs, radish, chives, strawberries and other small plants that are not going to become too heavy when they start growing. Position it properly and dew will flow off the house surface, watering the plants at night. • Lightweight aluminum garbage cans add a splash of industrial chic to a container garden. Old tin cans and aluminum soda cans can be used for an herb garden. 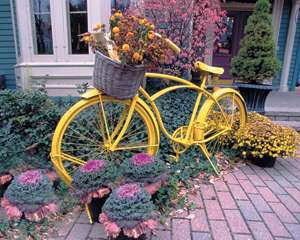 • A bike basket attached to a bike or not, can become a perfect pot. • Old boots are a fun place to plant leggy produce, but don't use rubber, which can leach and transfer toxins into the plants. • Recycle old furniture, such as a desk, drawers or sink into creative containers. • An over-the-door shoe pocket organizer doubles as an ingenious space-saving herb garden. • Along the same lines, old socks with a small cloth placed in the bottom to plug any holes provide a good home for herbs. Hanging them on a washing line just outside the kitchen window provides for easy access when cooking.